Our mission is to inspire young people to be science and technology leaders, by engaging them in exciting mentor-based programs that build science, technology, engineering, and math (STEM) skills in a diverse urban setting with a diverse student body where we create a culture of acceptance, pride, respect, and excellence. 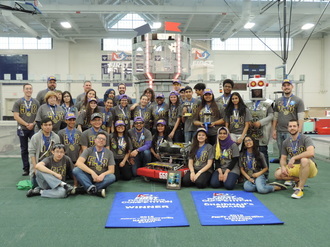 Elm City Robo Squad began in 2000 as part of a physics class at Hill Regional Career High School, an inner city, Title I, New Haven high school. A few years later, we became an after school program using a basement workroom. In 2006, the team moved to a robotics room on the school’s main floor. Since 2001 we have participated in FIRST (For Inspiration and Recognition of Science and Technology) robotics competitions where the team of about fifty students annually designs and builds a robot as part of a challenge. We began with only two engineers mentoring and now have twenty-four mentors. The team's sponsors include the New Haven Public Schools, a local university and numerous area businesses. In seventeen years, we have influenced the lives of more than 450 ethnically diverse high school students. In New Haven, where 25% of students don’t graduate, our students graduate, attend college and receive scholarships. Our team motto is Family, School, Robots. Anyone interested in joining the team, or learning more our organization for possible participation as a student, mentor or sponsor, please call us at 203-693-1558 or email us directly at elmcityrobosquad@gmail.com. In our history we have been honored with the following Blue Banners. We meet as needed. To find out more, please contact us!